Carlos González went 2-4 with three RBIs and Ian Desmond went 2-3 with two RBIs as the Rockies beat the Dodgers 10-7. Jeff Hoffman did his part as well, he pitched 5.1 innings of three-run ball and struck out eight batters on Thursday night. Hyun-Jin Ryu was on the wrong side of the scoring on Thursday night. He pitched only four innings and allowed ten runs (five earned) on eight hits. He also walked six batters, hit a batter, and was called for a balk. 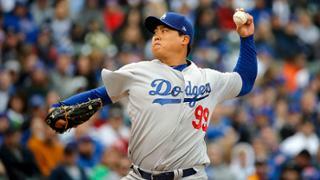 Although Ryu was charged with the loss, a disaster could have been avoided in the second inning. With a runner on first base in the second inning, Austin Barnes made a throwing error that allowed the Rockies to put runners on first and second. Ryu then recorded two outs, but the Rockies rallied for five runs in the frame, all with two outs. Desmond drove in the first runs for the Rockies in the bottom of the first inning. The Rockies had runners on second and third with two outs when Ryu threw a slider inside to Desmond. He lined it down the left-field line and into the corner, allowing both runners to score easily. The Rockies added more runs in the second inning after a throwing error by Barnes. With runners on first and second, Nolan Arenado hit a fastball to right-center field for a double. Both runners scored and the Rockies had a 4-0 lead. Mark Reynolds then got a changeup on the outer edge of the plate and hit it all the way to the wall. Arenado scored and Reynolds had a very long RBI single. Reynolds then stole second base and Dave Roberts decided to intentionally walk Desmond. That brought González to the plate and he double to right field allowing two more runs to score giving the Rockies a 7-0 lead. The Rockies were not done scoring, and after Ryu worked a 1-2-3 third inning, they pounced on him again in the fourth. He walked Arenado, then recorded an out, and then hit Desmond with a pitch to start the inning. That brought González to the plate and he hit a fastball into center field for an RBI single. Giving the Rockies an 8-0 lead with runners on the corners and one out. Pat Valakia then got a slider on the outer half of the plate and hit the ball to right field. Desmond scored and the Rockies had a 9-0 lead. The Rockies added another run on a balk by Ryu. Ryu began his windup then stepped off the rubber. The umpires correctly called a balk. The Dodgers began to attempt a comeback that would ultimately fall short. In the fifth inning, Scott Van Slyke entered the game as a pinch hitter and hit a solo home run cutting the deficit to 10-1. In the sixth, Cody Bellinger led off with a double, then Chase Utley hit a triple right center field. Barnes later doubled allowing Utley to score, cutting the Rockies’ lead to 10-3. In the eighth inning, Utley hit a single with one out, then with two outs, Barnes walked, putting runners on first and second. Yasmani Grandal brought both runners home with a double off the wall in left field. The double cut the Rockies’ lead to 10-5. In the top of the ninth, Kiké Hernández led off with a double, then scored on a single by Brett Eibner making it a 10-6 game. Bellinger then singled, forcing the Rockies to go to their closer Greg Holland. Chris Taylor singled, loading the bases and bringing Chase Utley to the plate. Utley grounded into a double play, allowing one run to score, but also giving the Dodgers two outs. Holland then struck out Yasiel Puig, earning the save and giving the Rockies the win. In the second inning, the Rockies had runners on first and second when Jeff Hoffman laid down a sacrifice bunt. Austin Barnes took a gamble and threw to second in an attempt to get the lead runner. His throw was low and Corey Seager was unable to dig it out of the dirt. If Barnes had thrown to first, Ryu would have made it out of the inning without any trouble. The reason for this is that he struck out the next batter, then induced a lineout. If there was already one out, which there should have been, Ryu would have got out of the inning with no trouble. Clayton Kershaw looks to pick his team up in game two of the four-game series and Tyler Chatwood will counter for the Rockies. Kershaw held the Rockies to two runs over seven innings in his last start against the Rockies. His last start at Coors Field, however, was not so good. He gave up four earned runs on three home runs, taking the loss. Kershaw does respond well to defeat and will go out very determined to win on Friday. The game will start at 5:40 pm PT and be televised on SportsNet LA and MLB Network.